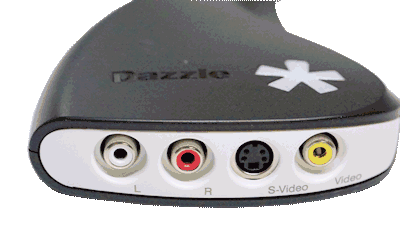 As I said in my news, Dazzle DVD Recorder HD is the last survivor of analog capture solutions sold by Pinnacle. 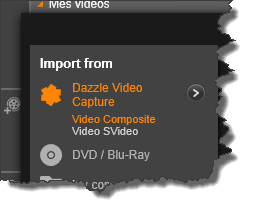 It is a USB capture device coupled to Pinnacle Studio for Dazzle. I propose you to discover it. At the rear, a USB cable type A to plug into your PC. The case seemed to me more cheap that different devices from Dazzle/Pinnacle I've had the opportunity to test. The plastic is matte black, the white Dazzle logo opaque. The USB cable is shorter than usual. We feel that the crisis is there. The hardware part is new and now supports Windows 7 and Windows 8, 32 or 64 bits, with the drivers included on the DVD. It actually embeds an Analog/Digital converter. The compression will be achieved through the capture software. PSD interface is identical to that of Pinnacle Studio 16. I told you earlier that this was a crippled version of PS16. Almost more limited than Pinnacle Studio 16 (basic). Yes, it is possible ! Connect your analog source, plug the device in a USB port on your PC, open Pinnacle Studio for Dazzle and click the Import tab. From left to right : brightness, contrast, sharpness, hue, saturation. 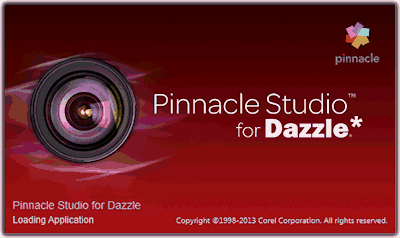 For those who do not want to install Pinnacle Studio for Dazzle because they already have a software capable of capturing video (any version of Pinnacle Studio, for example), the drivers are present on the installation DVD. With Windows Explorer, explore the DVD and open the Drivers folder. If your Windows is 32-bit, run the setup.exe that is in the x86 subfolder. If your Windows is 64-bit it is the setup.exe in the x64 subfolder that will be used. If you are running Windows 8.1 you'll have to install a patch available here. 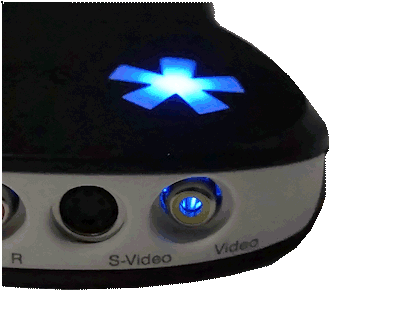 Unlike the HD in Dazzle DVD Recorder HD might suggest, you can capture only low resolution sources. Anyway, HD analog sources do not grow on trees. If you have on your PC Pinnacle Studio 16 and Pinnacle Studio for Dazzle and you want to uninstall it, do not do it especially from Windows Menu, All Programs, Pinnacle Studio for Dazzle, Uninstall Pinnacle Studio for Dazzle. 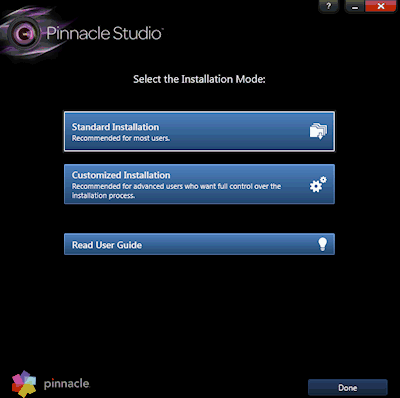 In this case, it is Pinnacle Studio 16 which is uninstalled ! The bug has been escalated to Pinnacle. Instead use the panel config of Windows, Uninstall a program. Everything will be fine. If you have on your computer Avid Studio, Pinnacle Studio 16 or Pinnacle Studio 17, open PSD and load from your hard drive the project The sky is the limit. Bingo! It loads in PSD with all its tracks, its effects, Montage themes ... Suddenly you have 5 tracks. I even tried with a home-made 17 tracks project from PS16 and it works. Yes, I know, it is useless, but I was quite proud of my find, I could not help to share it with you here. If the finished project is three hours long, will it be in perfect lip sync? Well it's been over a year since you made this guide, so I'm doubting you'll see this but It's worth a shot. 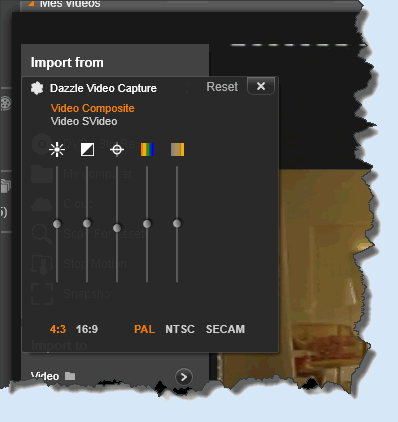 I'm trying to capture video with this product using the bundled software, Pinnacle Studio for Dazzle. I don't have any other software for this but I am familiar with Adobe Premier and Dxtory. The software in question seems very limited.. I can't seem to change the exported format to AVI, nor change the quality or bit rate, just the resolution. If you have any suggestions for alternate software or anything, please let me know! Need some help. Have a new PC (HP 500-437c) running Windows 8.1. No firewire port or card. I have a Sony HandyCam 250 (have a new HD camera as well, but the Sony has sentimental value). 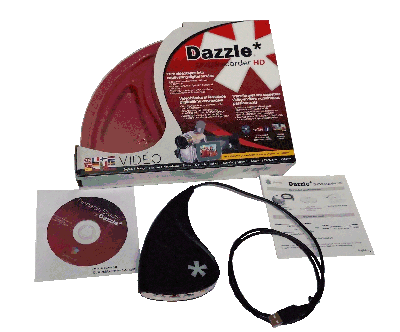 Can I use the Dazzle to just download content from the Sony to my PC using PS 18.5? I realize I will have to use the composite outputs on the camera, but I wanted a little feedback before I ordered a Dazzle . Windows 8.1 does NOT stream. Got Dazzle Silver, followed the instructions from Saby...and it works fine with Pinnacle 18 Ultimate. Thanks for the help.